Hi, I am interested in your 1965 Chevrolet Chevelle (stock #1062-NSH) listed on Autotrader for $52,995. I'd like to get more information about this vehicle and confirm its availability. 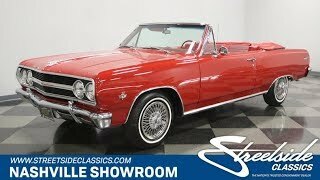 The Malibu SS was offered for only 2 years before the SS became a Chevelle only option. Compound that special status with it being an SS Convertible, with a believed to be numbers matching 327 engine, and what we present to you here is an opportunity to buy one very special car. When you are starting with a car this special by nature, you want to make sure to get the details right during the restoration. They did. The car was restored to be completely stock in appearance as it would have looked on the showroom floor in 1965. Of-course that starts with proper preparation. You can see that the body panels were worked and adjusted so that they were straight and the gaps between them consistent before a drop of that Red paint went on them. Then new chrome and trim was sourced for a super clean look. Up front, the blacked-out grill is the correct SS piece with some of that fresh trim surrounding the quad headlights with a bright shiny bumper underlining it. There is a 327 emblem on the front fender and Malibu SS on the rear with new wheel well and rocker chrome looking sharp too. The back of the car looks great with Chevrolet in script trimmed out with black and brightwork and another shiny new bumper. The interior worked the same way. Keep it stock. Stock just happens to be an absolutely gorgeous two-tone Red interior. The door panel has a red top and dark red bottom with horizontal pleats and chrome piping. The seats look awesome with pleated dark red center sections surrounded by smooth red panels. The upholstery work is outstanding and the craftsmanship carries through on the back seat and roof boot too. A red steering wheel with a semicircular chrome horn ring sits in front of an aluminum dash panel that is tucked between a padded red upper and painted red lower. The panel and gauges are meticulously polished up and detailed out with the tach in the center, the speedo on the left and the engine gauges on the right. A T-handle shifter for the automatic transmission sits in the center console and Malibu SS appears in script on the glove box. Red carpets are of course perfect and protected by red vinyl floor mats. The whole interior is fresh, clean and just like new. Under the hood you will find that precious, original, 327. It has also been restored to all its showroom original glory and is nestled down in an engine bay that received as much attention to detail as the rest of the car. There is even an original GM washer bottle mounted in its proper bracket on the inner fender well. A black snorkel air filter housing with a 327 Turbo-Fire decal sits on top of a four-barrel carburetor. The engine iron is painted the correct color of Chevrolet Orange as are the valve covers which also have decals proudly announcing it as the 327 Turbo-Fire 300 Horsepower motor. All that power is sent back through a 2-speed automatic transmission to the rear axle which rides on trailing arms and coil springs. Power steering works through control arms with coil springs and a sway bar up front and power brakes provide good stopping power. The car sits 205/75R14 white wall tires all around which are mounted on steel wheels with center spin wire wheel covers. An awesome car because it is a beautiful, classic, Red convertible V8. Very special because it is a rare, numbers matching car that has been restored to all its stock, original glory. Come on down and check it out.